How’d we find a unifying phrase so fast? It’s been evolving for years. ‘Boston Strong.” The two-word motto has been everywhere in Boston since the Marathon bombings a month ago, a handy shorthand for defiance, solidarity, and caring. In its ubiquity, “Boston Strong” presents a united front in the face of threat. As a verbal meme, “Boston Strong” spread so quickly that it felt like a blooming organic force. Almost instantly, it adorned countless T-shirts, hats, and ribbons. MBTA buses began flashing it on their LED signs, and a state legislator proposed putting it on a special license plate to raise funds for victims. When a benefit concert headlined by Aerosmith was announced for later this month, “Boston Strong” was the obvious name. Call it the city’s post-disaster brand. But while it may have seemed to come out of nowhere, it actually draws on years of development by other “strong” brands. The rapid success of “Boston Strong” shows just how much we have learned from the advertising world in the creation of catch phrases that “stick,” even when they are inspired by utterly unexpected events. Where did the “X strong” trope come from? An early source is now shrouded in ignominy: “Livestrong,” the name of Lance Armstrong’s ­foundation intended to raise money for cancer survivors. 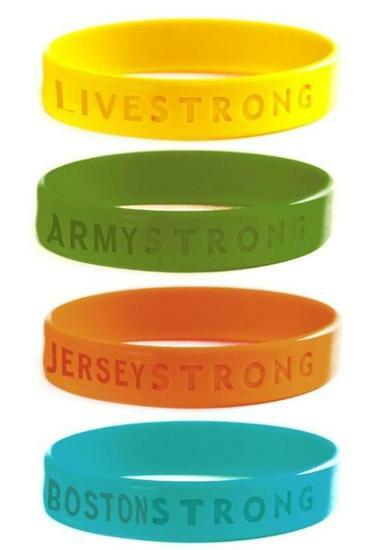 While Armstrong and his charity endeavors have been discredited since his doping revelations, the yellow “Livestrong” wristbands were a huge philanthropic success story when they debuted a decade ago. The “strong” element of “Livestrong” played off Armstrong’s last name, obviously, turning what is typically an adjective into a so-called flat adverb — that is, an adverb without the “-ly” ending. “Young people with cancer should be empowered to fight hard, dream big, and live strong,” Armstrong said in 2004. Since then, other subtypes of “strong” have emerged in popular culture. In 2007, the country singer Britni Hoover released her debut album, “Country Strong.” The title track would, a few years later, lend its name to a movie starring Gwyneth Paltrow, and Paltrow recorded her own version of the tune. “But I won’t stay down long, ’cause I’m country strong,” the song goes, expressing a defiant note common to the “X Strong” theme. That defiance soon became tied to catastrophic events, as “strong” started getting modified by names of places in distress. After Hurricane Irene ravaged Vermont in August 2011, Lyz Tomsuden and Eric Mallette of Rutland, Vt., started a charity campaign, selling T-shirts reading “I am Vermont strong.” The campaign was so successful that the state adopted the slogan as well. Governor Peter Shumlin, in his 2012 annual address, announced that “the state of our state is strong. Vermont strong!” Shumlin also introduced “Vermont Strong” license plates to benefit the Vermont Disaster Relief Fund. Then, when Hurricane Sandy hit the New Jersey shore in October of the next year, “Jersey Strong” became the rallying cry. But it turned out that a trademark had been filed for the phrase back in 2007 by Work Out World, a chain of health clubs. With Governor Chris Christie and many others taking up “Jersey Strong” as a mantra for rebuilding shore towns, Work Out World’s founders didn’t fight it, and instead set up a Jersey Strong Foundation dedicated to the Sandy relief efforts. Despite that glimmer of contentiousness, “Boston Strong” has succeeded, like “Vermont Strong” and “Jersey Strong” before it, as a regional expression of solidarity allowing residents to rally under a common banner. And in the form “We are Boston Strong,” the inclusive pronoun “we” allows sympathetic outsiders to take part in a show of strength, much like the related motto, “We are all Bostonians.” It’s a rhetorical trope that lets everyone identify with Boston’s special kind of “strong,” built on so many “strongs” before it.